of Vedic Educational System. 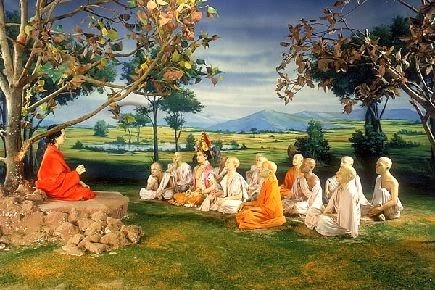 Ancient education emerged from the Vedas. education in a unique system called ‘Gurukulas’. mind for the betterment of the individual and society. ∗ Education for other world lines. ∗ All round development for Personality. ∗ Education only a means and not an end in itself. 6. Stress on other worldliness. • Meditation (Nidhidhyarama represents the highest stage.). upto the age of 24, after which he was expected to enter domestic life. the influence of his personality. He was sincere and honest to his work. behave properly with the elders and in assemblies. individual, free from passions, full of universal affection, continuously selfeducating and striving to reach the highest goal. • Vedas are the eldest World Literature. • Suitable age of education. • Equal rights to education for all. • Education standard in the family. • Equal opportunity to gain education. • Sanskrit as the Medium of Instruction. • Education is through travel. guru called ‘antevasin’ under the direct supervision of their Guru. his residence where the students used to stay during the period of study. Gradually, the Gurukula were extended to include a number of buildings. correspondences to University of students belonging to different colleges. discussions and competitions generally on the invitation of the king. I went over this website and I conceive you've got a large number of splendid information,Are you needing an outline for you for your essay?